What color is Zen? Wisconsin painter Terrence Coffman seems to know. He ostensibly treads in abstract expressionism’s historical modernism. By contrast, the state’s most notable art tradition stems from the great Midwest regionalists, including Wisconsin’s adopted son, John Steuart Curry. 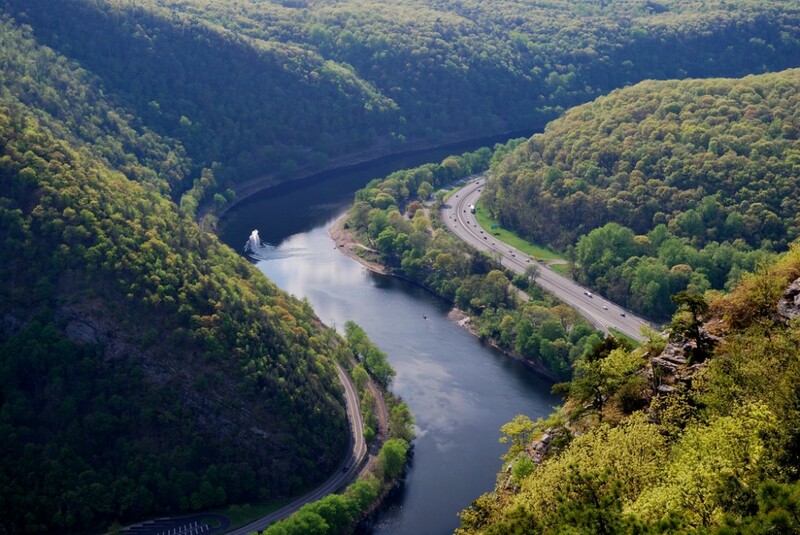 Accordingly, most of the state’s dominant art trends have interfaced with the state’s abundant natural resources, including the architectural giant Frank Lloyd Wright. That sounds grandiose but he’s striving for, and far beyond, the indigenous terrain, saying he draws from Zen disciplines of China and India. The result: painterly evocations of the highest order. Coffman, who served as president of the Milwaukee Institute of Art and Design for 20 years, meditatively “breathes in” aspects of intensely atmospheric landscapes, or townscapes of Jefferson, WI, his residence. The exhalation effect resembles California color-field abstractionist Richard Diebenkorn who, like Coffman, employed landscape-derived subject series and, atypical to New York abstract expressionists, often in pastels. Coffman has a similarly stunning gift for conjuring beauty that sometimes disappeared in the brawny abstract-expressionist process. Coffman does embrace that movement’s grand tradition of large-scale paintings. 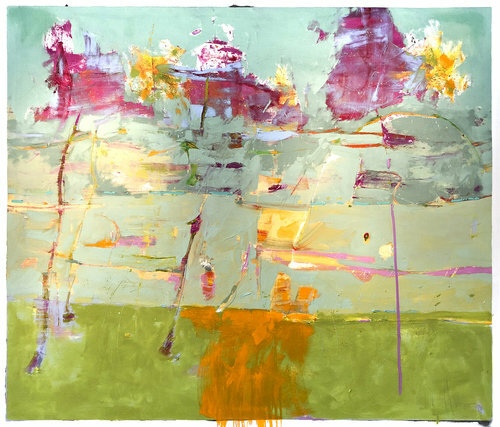 And yet, the eye-drowning 72-by-84 inch “Gail’s Garden 10” is something of an extreme “close-up.” It recalls ab-ex pioneer Arshile Gorky’s approach of literally diving his face and nose into a garden, to blur his focus but intensify his sensory experience. So we see here two giant rose-like stems and blossoms, and the canvas divides into three large horizontal segments akin to layers of earth, yet they’re all sun-lit in pastel tones. Horizontal streaks effect a weird suspended feeling. Along with such perceptual sleight-of-hand, you also detect small graphite scribbles, suggesting germinating seeds. 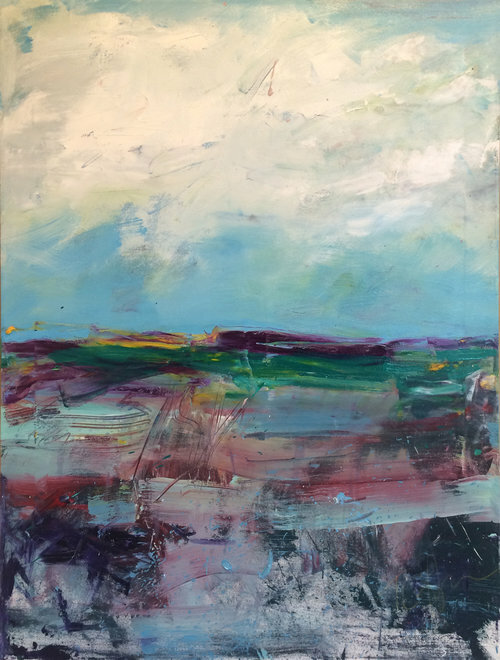 “A Long Way Home #4” oil, 40 by 20 inches. These slight effects help distinguish Coffman from typical abstract expressionism. He also does very small-scale paintings, demanding fine techniques. So even his biggest canvases reveal miniscule spatters of paint, like a Jackson Pollock “mini-me” standing between his legs. But he’s nobody’s knock-off. Coffman also wields storytelling emotional power, in his two “A Long Way from Home” variations. In Number 4 (above), white clouds chill the spirit; the terrain seems like psychic mazes that might circle him back where he started, a classic nightmare. 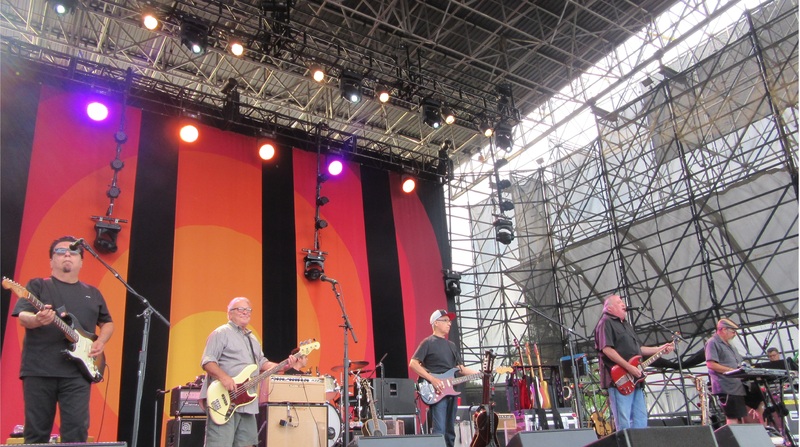 Like a burning spear cutting through the thick informational gaslight of the present, this quote, from the longtime Los Lobos multi-instrumentalist Steve Berlin, kept nagging at me, as I followed the contrivances and hypocrisies of the Trump administration’s border family separation policy. Yes, there’s a very serious mess largely manufactured by the Trump administration, which needs to give due process to refugees requesting asylum and to re-unite separated children with their parents and properly and fairly deal with unaccompanied young illegal border-crossers. And yes, many of these refugees come from Central America. But the big perceived problem — the motivation for the fabled Trump border wall — initially had to do with Mexicans crossing the border, as then-candidate Trump framed it originally. So I am reposting this article as an instructive cultural offering, especially to those who think that Latinos from south of the border have very little to offer, and are only here to take away jobs from white people. 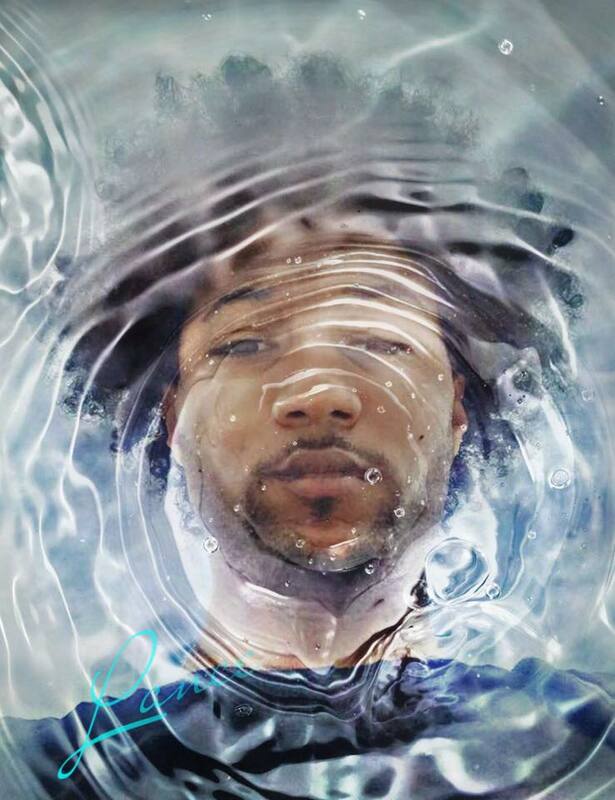 Especially if you have at least some appreciation of excellent rock music with Latin rhythms, soul and great storytelling, then I hope you read this story, which is a look at a great music group, centered on their superb last album Band of Gold. The article was commissioned as a cover story for the online publication NoDepression.com. Thus, it is fairly in-depth, but I think it’s a good read and I hope you get something out of it. It includes original interviews with Steve Berlin — the band’s only gringo — and with the group’s primary songwriter-guitarist, Louie Perez. Click! The eye of the camera sees like a stealthy cat – the truth of abject starvation, misery, and resilient energy, and even the embodiment of blooming intelligence. The camera eye travels very well, bringing the earth’s far-flung corners into focus – something very evident in Inspiring Change: The Photography of Chip Duncan and Mohamed Amin at the Charles Allis Art Museum, through October 21. Milwaukee-based photographer and videographer Chip Duncan – author of documentaries for NPR, HBO and Discovery, among other media outlets – has prowled 40 largely Third World countries exposing poverty and famine. Almost incongruously, his often-lovely images stand sharp but painterly in hue. Laden with vivid form, contrasting textures, and saturating color, his subjects radiate anguish, ardor and myriad beauty of humanity. He’s a pro’s pro cameraman. Duncan’s great inspiration is fellow exhibitor, the late Mohamed Amin, a true profile in courage. 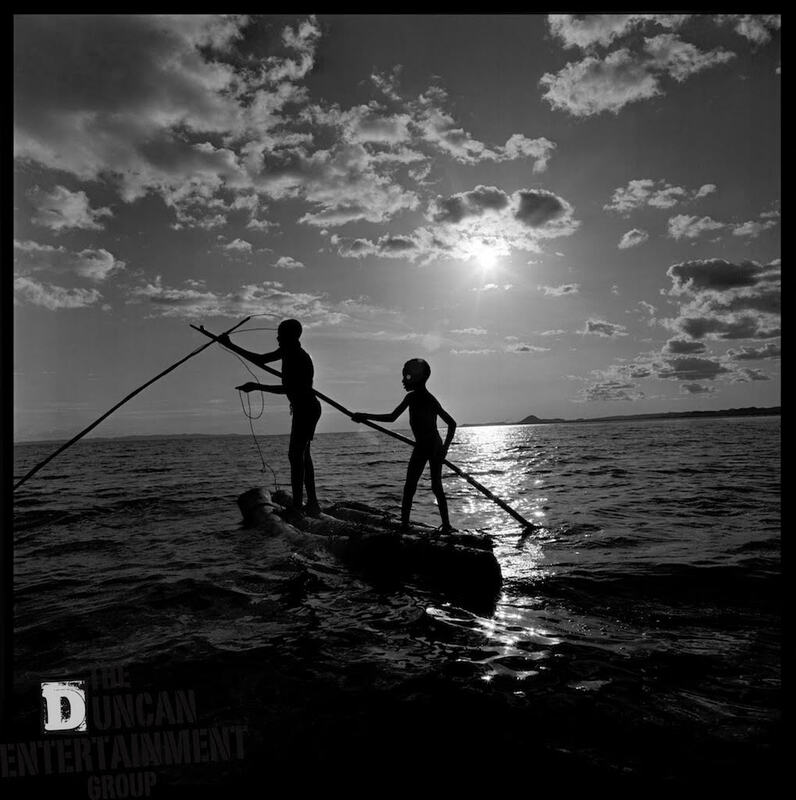 The Kenyan’s largely black-and-white work lends gravitas and vitality to Duncan’s, by juxtaposition and association. Amin documented Ethiopia’s devastating 1984 famine, and he’s credited for spurring hunger-relief movements – Live Aid concerts, Band Aid and USA for Africa. 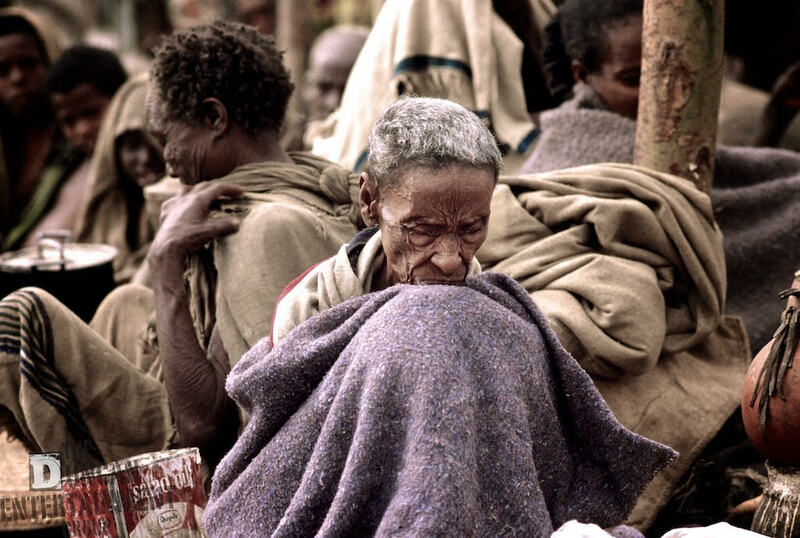 This photo of an elderly man, taken by Mohammed Amin during the Ethiopian famine, helped bring international attention and aid to the African crisis. While covering Kenyan pro-democracy unrest, Amin endured 28 days of torture from the oppressive government. In 1991, during the Ethiopian Civil War, he lost his left arm at the elbow in an ammunition dump explosion. He remained disabled professionally until a prosthetic arm helped him to handle cameras again. In 1996, hijackers took over an Ethiopian airlines flight, with Amin aboard. He attempted to rally passengers and confront the hijackers. But the plane crashed into the Indian Ocean and he died at age 53. Amin wasn’t ignored at the time, but his work still merits further exposure — his journalism, artistry and the dramatic and small human truths it preserved. Three brief, recommended video films complement the photos – one of Duncan introducing his work, another of Amin documenting famine, and a third, of Amin’s son Salim, narrating his father’s powerful story. In the second video, we see a young boy’s fly-infested face and a child’s starved corpse. Yet Amin never exploits suffering for excessive effect, even when capturing beauty. In “Fishing,” shimmering clouds and the sinking sun silhouette two emaciated anglers standing precariously in a slender boat, hoping to spear some food. 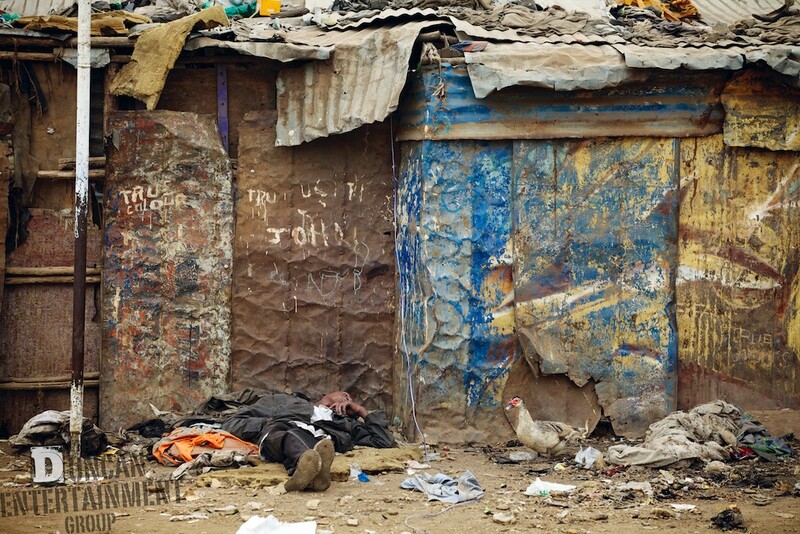 In one of Duncan’s photos (“True Colour,” at top), a seemingly homeless man lies asleep below a ramshackle house festooned with kaleidoscopic graffiti, with a duck nearby, wondering about him. 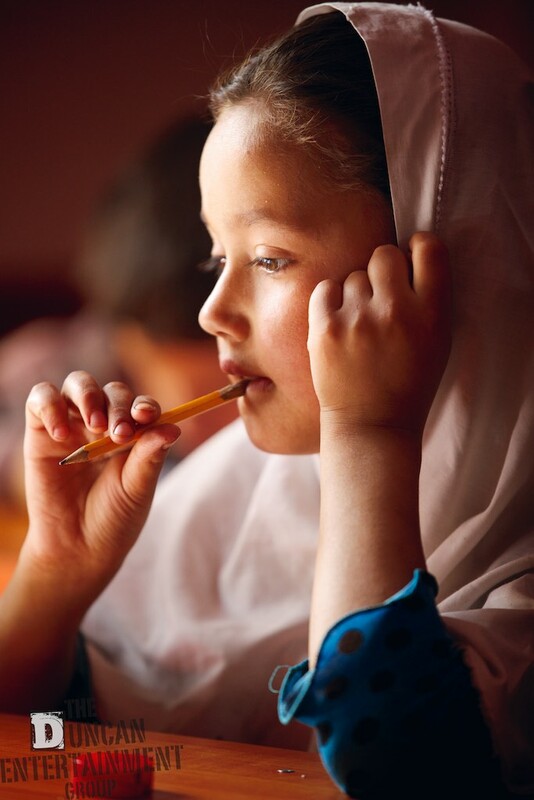 Duncan’s images seem more hopeful overall, exemplified by “Empowerment” – a young Afghani girl, bathed in a Vermeer-like glow, chews on a pencil, poised to write, and enable her nation. The 2018 Isthmus Jazz Festival in Madison is well underway but it has reimagined and reinvented itself into one of the largest jazz festival events in Wisconsin history. In collaboration with the Madison Jazz Consortium, the fest has done this by reclaiming and redistributing its resources into a vast, community-oriented event that also seems unique in the state’s history. So even if you’re only a not-too-long-drive away, it’s promising to be a remarkably rich cultural experience. The event has expanded to ten days, having begun on June 1 and running officially through this Sunday. Plus, several major events extend beyond the official festival, further into June but adding up to an extraordinarily rich extension of the festival’s ambitious parameters. The Isthmus Festival has both more free and richly diverse events, and more ticketed events than in the past. Among the notable events already passed are the Emerson Hunton Quintet with Greg Ward and Russ Johnson along with the former city poet laureate Fabu’s publication celebration for her book about Mary Lou Williams; the brilliant multi-instrumentalist and conceptualist Hanah Jon Taylor’s commissioned new work “Songs for the Emerging Man;” The New Breed Jam’s “Wayne Shorter Night;” and the ingenious Chicago flamenco jazz guitarist Goran Ivanovic. AND TODAY, FRIDAY, the unique and popular Strollin’ State Street neighborhood series continues into the evening with events at the Wisconsin Historical Museum, on the UW-Madison campus mall, and Fair Trade Coffee, Nick’s Restaurant and Parthenon Gyros, all on State Street. Among today’s most appealing events is The PLUGGED IN & SCRAP METAL HORNS at BEHIND THE BEAT JAZZ SERIES. Madison’s newest eleven-piece band covers 60 years of jazz, R&B, and horn-rock. Their repertoire includes Santana to St. Paul and the Broken Bones, Dusty Springfield, Ray LaMontagne, Chicago, Nathaniel Rateliff and the Night Sweats 5-7pm. Friday. It’s free admission at UW Memorial Union Terrace, 800 Langdon St.
6/9 “Kids Jazz Exploration & Magical Concert” with John Becker, Laurie Lang and Chris Wagoner at the Madison Children’s Museum @ 10am. 6/9 Panchromatic Steel, Huntertones, Alison Margaret Quintet, High School Jazz All-Stars, Edgewood College Jazz Band on the UW Memorial Union Terrace from 2-11pm. 6/10 Madison Jazz Society presents the Chicago Cellar Boys in concert at the Wyndham Garden Hotel in Fitchburg @ 1pm. And then, a number of notable and compelling events extend through the month, although not part of the official four-day event. June 17: BROKEN SHADOWS at ARTS + LITERATURE LABORATORY. Broken Shadows, a new project (named for an Ornette Coleman album) features four world-class musicians hailing from the urban northern half of America. Tim Berne (sax), Chris Speed (clarinet/sax), Reid Anderson (bass) and Dave King (drums) have banded together to reinterpret the timeless sounds of great men from the rural South and heartland of the country: Ornette Coleman, Julius Hemphill, Dewey Redman and Charlie Haden. The group symbolically and culturally strives to bridge an historic divide that remains deep in America, between the South and North. 8pm. ALL, Arts + Literature Laboratory, 2021 Winnebago. Tickets $20 advance; $25 at the door. 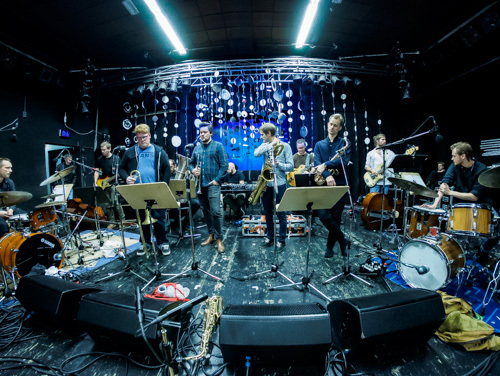 byArts + Literature Laboratory, Nilssen-Love’s Large Unit debuted at the Molde Jazz festival July 2013 and has since toured Norway and played festivals all over Europe. Consisting of mostly younger Norwegian musicians, Large Unit manifests as “an intense powerhouse force on stage, but also veers into more subtle and textural passages.” 953 Jenifer St., 8pm. Tickets $20 advance; $25 at the door. 6/24: GOLPE TIERRA at ALLEN CENTENNIAL GARDEN. The irresistible acoustic groove of Golpe Tierra will kick off the 2nd Summer Sunday concert series at ACG. Nick Moran, Juan Tomas Martinez, Tony Barba, and Richard Hildner comprise this guerrilla-style ensemble, employing the traditional Afro-Peruvian guitar-bass-cajón set-up. The group embarks on a musical journey throughout Latin-America, encompassing blues, jazz, and shades of soul. Allen Centennial Garden, 620 Babcock Dr., 5pm. Free admission & nearby parking. Bring a chair for comfort. I’ll get to the city’s latest national exposure for its most recent police brutality and no, it doesn’t have to do with Sterling Brown. But first, this blog strives to take a larger perspective on things like brutality in the big city. 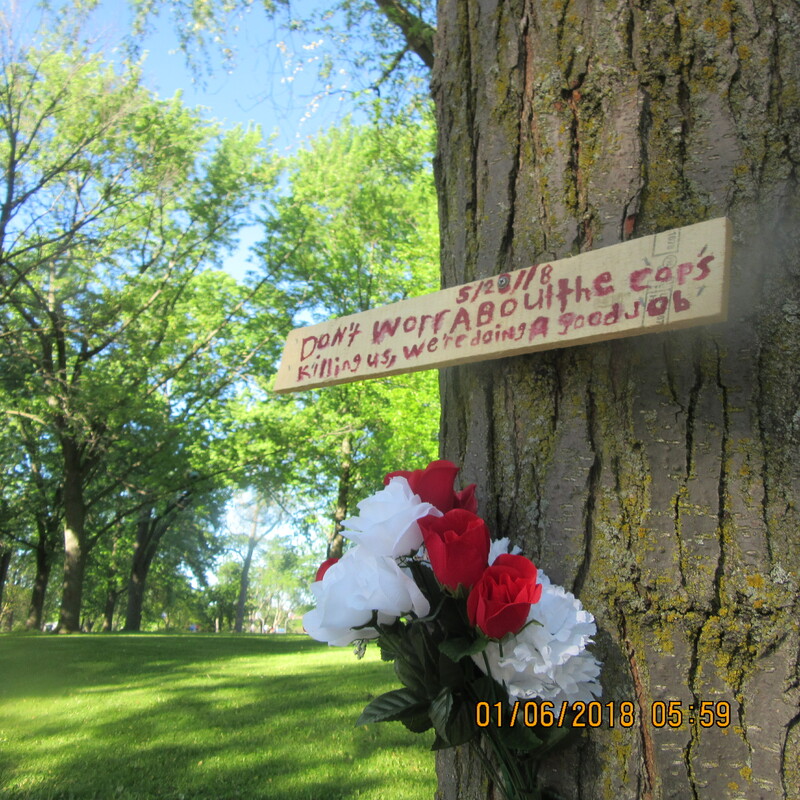 I would note a sad and tragic counterpoint to such nastiness, provided by a person who posted a trenchant memorial to a man fatally shot Monday during Memorial Day picnicking in Kern Park in Riverwest, the neighborhood where I live, and a few blocks away from where I type this post. I truly do love the hip, diverse and gracefully lived-in Riverwest neighborhood, and have celebrated it on this blog. I have resided here for the majority of my adult years in Milwaukee. But I do not want to idealize the neighborhood, rather underscore that Riverwest is part of the real world. This homicide, which remains an open case with no perpetrator yet caught, occurred in a park that I enjoy and partake of. I frequently go to Kern Park to take its walkways down to scenic, meandering Milwaukee River pathways. I also sometimes enjoy shooting buckets at the basketball courts faintly visible a ways beyond the “memorial tree” (depicted at top). Witnesses say they saw the victim, Juan Bernal, on the basketball courts –- when they heard gunfire at around 2 p.m. Monday, Memorial Day. “Everybody disappeared from the basketball court. 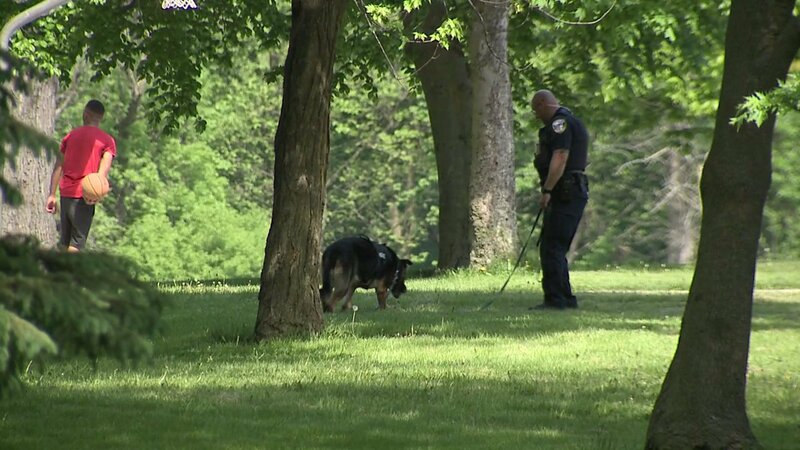 He came running across the park and that’s when he fell on the street,” said Janelle Bentson, a witness told Fox 6 news. The sign appears to address the issue of so-called “black-on-black” violence, part of the larger urban social fabric in America that’s badly torn, and abused and exploited by the institutional racism of Wisconsin’s judicial and prison system. Statistics show that people of color are arrested, sentenced and imprisoned in this state at rates that far exceed the national norm. And this photo of Bernal is courtesy of Milwaukee musician Jay Anderson. Thanks Jay, for this beautiful image. As a Wisconsin and Riverwest resident, my heart aches that the Kern Park incident provided another sort of memorial that expands the sober implications of the holiday, like a steady trickle of blood, that never seems to end. Is it too early to judge what prompted this police brutality in the video below? the Milwaukee Black Panther spokesman addresses the issue succinctly. The video does not show the black youth’s alleged attack on a police officer. You do see him punched twice by Wauwatosa police, and arrested. “Call my mama, bro! 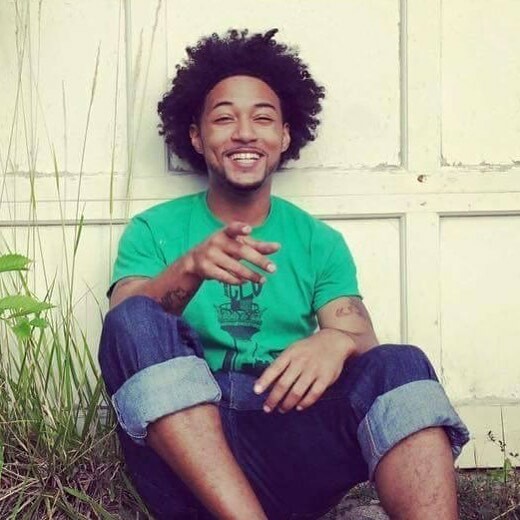 Call my mama, bro!” the youth repeatedly calls out while on the ground and handcuffed behind his back. It hardly seems like the behavior of a person feeling guilty of something. The youth – who allegedly helped cause a disturbance at Mayfair Mall – was released a short time later. After internal investigation by the Wauwatosa police department, no officers involved in the mid-May incident were disciplined. Unfortunately the disturbing incident again visited national television attention upon Milwaukee this morning on AM Joy on MSNBC. “And the president sanctions excessive force,” host Joy Reid noted, after showing a video clip of President Trump commenting on the issue. And this blogger has posted a number of times previously here and on Facebook, decrying the problem of police brutality, particularly on unarmed black man, which evidently happened here yet again. 1 At another level of police-race relations, it’s heartening that Starbucks Corporation closed down its hundreds of stores recently for a day of racial-bias sensitivity training after Starbucks employees called the police simply because to black men were in Starbucks coffee shop waiting for a friend. The two men were arrested, prompting outcry nationally and a realization of a problem amongst Starbucks leaders.